Subadult male Cheiracanthium mildei, copyright John R. Maxwell. 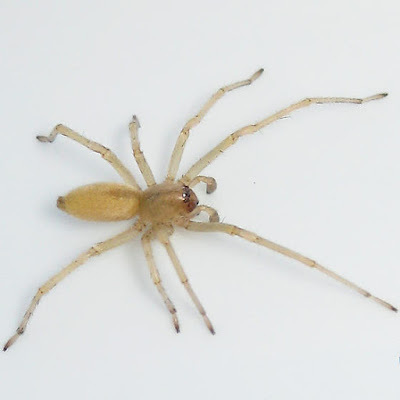 The Miturgidae are a group of ecribellate spiders with two-segmented posterior spinnerets. Characters (from Jocqué & Dippenaar-Schoeman 2007): Small to very large araneomorph spiders; eight eyes, grate-shaped tapetum; three pairs of weak spines on venter of tibiae I & II of females; males lack tibial crack; two tarsal claws; ecribellate; posterior spinnerets two-segmented, distal segment long or short; spigots only apical on posterior median spinnerets of females; entelegyne. [E07] Elliott, M. G. 2007. Annotated catalogue of the Pompilidae (Hymenoptera) of Australia. Zootaxa 1428: 1-83. [L-M-HG08] Lo-Man-Hung, N. F., T. A. Gardner, M. A. Ribeiro-Júnior, J. Barlow & A. B. Bonaldo. 2008. The value of primary, secondary, and plantation forests for Neotropical epigeic arachnids. Journal of Arachnology 36 (2): 394–401.